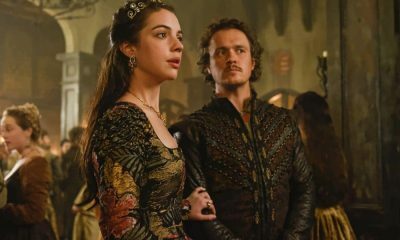 After the Season 2 finale of REIGN, life in French Court seemed on the surface settled and at peace after Mary (Adelaide Kane) and Francis (Toby Regbo) reconciled and Prince Conde (Sean Teale) had fled the dungeon with the aid of Queen Elizabeth’s spies. Yet things are not as idyllic as would seem with the shocking betrayal by Catherine de Medici (Megan Follows) who aligned with mortal enemy Queen Elizabeth (Rachel Skarsten) to take down Mary, Queen of Scots, Bash’s wife Kenna (Kaitlin Stasey) befriending a young king (Torrance Coombs) after it was revealed she was pregnant with a traitor’s baby, and Greer rejected Leith’s (Jonathan Keltz’s) second marriage proposal. So at best things seem a bit uncertain for the royals and those whose lives are intertwined around them. At the CBS Summer Soiree event, stars Torrance Coombs and Jonathan Keltz talked about what Season 3 holds in store for their characters Bash and Leith and the various lady loves in their lives. 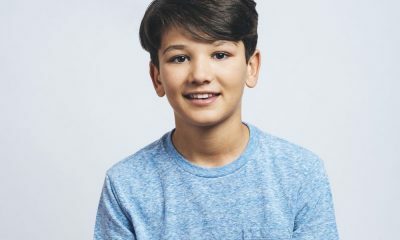 At the end of the season, Bash and Kenna are back on the outs, which broke everyone’s hearts in a big way, just as we were thinking that they were going to get back together and then that hope was cruelly snatched away again. TORRANCE: It’s just symptomatic of problems that were underlying their relationship from the beginning. They were working those out for awhile and then they realized that they were on different paths. Is Bash going to be pursuing his new lady love Delphine (Alexandra Ordolis)? She was nearly burnt at the stake and then she surprisingly broke free and took off. TORRANCE: (Laughs) She kind of just did, and left him with a kind of burning sensation — which is usually a bad idea. You don’t like that out of a new girlfriend. But now she is linked to him in this bonded way. TORRANCE: Yeah, as I understand it, the link simply doesn’t go away. They don’t tell me much, but I do have a sense that effect will be lingering. Technically, I guess he is still married to Kenna. But one of his girlfriends hissed and ran into the woods, and the other one got on a boat and started hitting on underage men. So he’s a free-agent, pretty much. Do you think Bash is going to swear off women for a little bit? TORRANCE: (Laughs) No, I don’t think he can stay away — and that’s the nature of drama. But he is drawn to the wrong women, women who have brought him nothing but trouble. TORRANCE: Yeah, but I imagine that will continue. He keeps finding them in the woods. And it’s tough to do when a pretty girl comes up and shows some interest, he doesn’t want to send them away. It’s tough. There was also more of a boy’s club vibe this past season with the addition of Louis and Narcisse (Craig Parker). How much fun was that for you? TORRANCE: They are great. Actually, they had both just gotten into town and they sent us all out riding together and so I met them in the car on the way out to go horse riding and we all bonded quickly. They fit right into the cast and it was like they had been there all along. But it was fun to have a boy’s outing. It’s nice each season, as much as we love everybody, it’s nice to inject new blood. It just freshens things up. The new person has just a little bit more energy, is a little bit more excited about the whole thing and it rubs off. It’s like a sports scene, they bring in new players each year to keep everybody on their toes. What was one of your favorite storylines introduced from last season? TORRANCE: There are so many. Honestly, I had a lot of fun with the Delphine stuff because it was so weird and you don’t know where that is going. And I guess Kenna with her relationship problems — it’s funny like you get attached to people — and I got attached to the idea of that relationship with Kenna — and you catch yourself fighting for a fictional relationship, like the decision to end it, and you realize you had an emotional attachment to it. It’s not a logical one and it’s not what is interesting for the show, but it’s just like: “No, I don’t want to breakup” You just feel bad, like you’re breaking up with your friend and you feel like [the characters] are having an argument for silly reasons. I imagine the audience is asking that too: why are they fighting again? And as an actor, I’m like: “I don’t want to be fighting again.” I just want to be nice and have a good time with everybody. TORRANCE: That’s what they are hoping. They want to instill that feeling that people are not necessarily safe. That’s what they did at the end of the season, reminding people that Francis is in a bit of trouble. That Francis is not going to have a long and healthy life. TORRANCE: No, and whatever they choose to do with him, he’s in trouble. Are you a bit more worried about the safety of Bash now that the show has stuck a sword through him and he nearly died? TORRANCE: It’s funny you mention that because towards the end of the season they started taking my shirt off for just about everything and there is a whole routine now because of all the swords and arrows that have gone through Bash, the makeup girl Ashley has to spend an hour putting scars on me if we think there is a chance the shirt may come off. There has been just so many near death experiences — and we’ll see, maybe one of these near deaths will be a real death experience — Bash keeps escaping by the skin of his teeth so far. 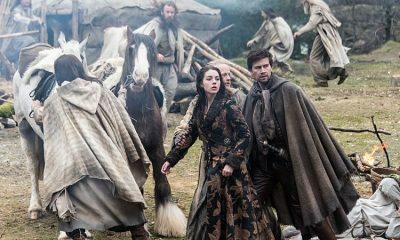 Another storyline that we’re paying close attention to is what is going on with Lola (Anna Popplewell) and Narcisse. It’s like a forbidden-fruit relationship and the show is playing with that. Laurie McCarthy mentioned that the show may be delving into that next season. TORRANCE: I’d love to see that. I just want to see more baths. I need more “bath time.” We could have a whole spinoff show “Narcisse’s Bath Hour.” It would be an interview series where he takes different people and puts them in a bath and draws them while he interviews them. A kind of Bob Ross/PBS kind of thing. I think that would be a good show. I think it would be a hit. I think I’ll pitch that. Maybe as a webseries. REIGN is going to be on Friday nights now, so it could do a bit more of the risqué stuff. TORRANCE: That’s exactly it! People are staying in on a Friday night. They want to see something. They want to see the good stuff. That would be a definite plus to being on a Friday night, if they lift the restrictions on us a little bit. Maybe get some thrusting motions and a little tongue, or something. I’m pretty sure the censors are against showing any kind of thrusting on broadcast shows. TORRANCE: Damn, you FCC! Oh well. Fans have been kind of itching for a sword fight between Narcisse and Louis, who would you like to see Bash have a big sword fight with? TORRANCE: It would be fun to have a sword fight with anybody, really. I had such a good time in the second to the last episode of this season where I had a big sword fight. We had a few hours to rehearse it and we had all day to shoot it. Usually, we only get 5-6 hours and what you get is what you get and then they throw the stunt guys in to do it properly and hopefully cut to your face to make you look cool. But this last one was mostly us the whole way time. We spent a good 14 hours just shooting it. There was a bunch of it that got cut and I see why it was cut, but the way it was all cut together I think it was the best battle that we have done on the show. TORRANCE: That’s the thing: midway through the season you are not too worried, like if they kill that guy, they have to pay him to the end [of the season] so they won’t do that. But towards the end of the season, all bets are off. They can kill anybody. So would you like to see Bash do a fight with his brother Francis or with Louis? Who does he deserve to have a big fight with? TORRANCE: It’s quite a miracle that he hasn’t taken on Narcisse. Bash has killed people for less. He’s killed innocent shepherds for knowing too much. Meanwhile, Narcisse is trying to bring down the whole kingdom and he is dining with the queen. Now that you mention it, it is surprising that Bash hasn’t had a big confrontation with Narcisse in Season 2. TORRANCE: I’d have loved something like that. But there was a lot to fit into the season already. We were already cutting pages because there were so many storylines. So I’m not surprised it didn’t happen, but it would be a fun thing to explore. Either that or the bath scenes. TORRANCE: I’d get in the bath with Narcisse. Maybe that is what it is. Maybe he just needs to take a bath with Bash and he’s just stab him underneath the suds or something. I think the FCC would like that. Then suddenly the bath water turns red and Narcisse slowly bleeds out and Bash steps out of the bath and towel off. (Laughs) I should be writing this thing. Another storyline introduced in the finale is Greer has been welcomed back to court. What do you think that is going to be like in Season 3? TORRANCE: I didn’t realize that either, but that’s the trick of the show: they always trying to think of a way to get people back to the castle. You can leave the castle, but it’s like the island on LOST — you can never really leave the island. 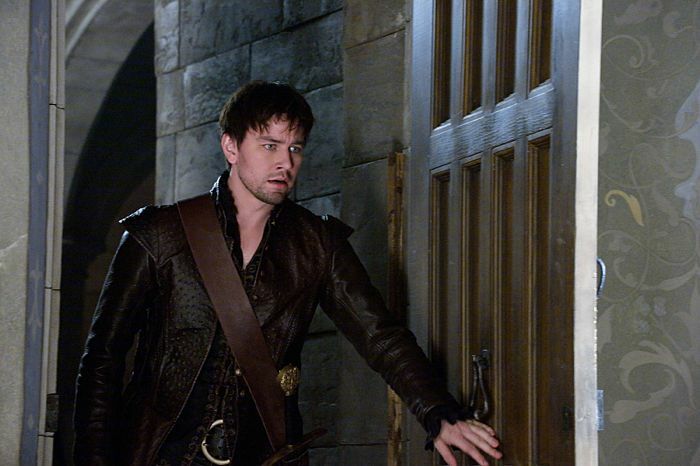 So on REIGN, you never really can leave the castle as we will always bring you back to the castle. TORRANCE: Yeah, they don’t get seduced by the wonders of court. I could see a friendship between them, not necessarily a romance, but a friendship between Bash and Greer. TORRANCE: That would be interesting because those characters haven’t shared much screen time at all. We joke about that sometimes — when characters will get randomly a scene together, like: “We’ve never put them together and let’s see what happens there.” Those two characters have only ever appeared in group scenes, and one-on-one I have no idea what they would talk about. There’s some material there I’ll bet. We could do with some more awkward conversation on the show. Everybody is really self-assured and knows what they are saying all the time. I feel like we could have more awkward silences, where people just don’t know what to say to each other. And that would be one of those scenes, maybe. With all the plotting and scheming that is bound to happen now that Queen Elizabeth has joined the show for Season 3, things could get interesting. TORRANCE: Yes, we’ve got a lot of queens now. It’s like playing a weird game of chess and there’s too many queens on the board and what are you going to do. TORRANCE: We’ll see. I don’t know where things are going cause if — and I don’t know what their plans are — but if Francis perishes from whatever he is going through — he’s the one that is keeping Bash there. Bash doesn’t have a wife anymore, he doesn’t have a relationship with Catherine particularly or with his younger half-brothers particularly. So if Francis is gone, where does Bash go? Don’t you think Bash’s alliance would be to the kingdom of France? TORRANCE: Either that or his alliance would be to Mary. He would follow her wherever she may go. TORRANCE: Maybe. I don’t know. That could be a possibility for him. It seemed like that romance was long gone. TORRANCE: Maybe it’s just the long-game. Or heroic death in a sword fight with Narcisse or Narcisse stabs him in the bath. We decided the bath is more interesting than the sword fight. I’m on board with the long-game between Mary and Bash if that plays out. TORRANCE: Let’s give people some hope. Let’s just say Bash is playing the long-game. Love that. It’s actually kind of romantic. TORRANCE: He’s just been waiting for Mary to come around. And waiting for all the other men to die off around her. Bash had a long conversation with Nostradamus before he took off, didn’t he, about that vision of Francis’ death? The show broke everyone’s hearts where they left things with Greer and Leith at the end of the season. But now that we know Greer is going to be back at court next season, do you think that romance is completely off the table? JONATHAN: I think this the second time he has asked her to marry him and, unfortunately, this is the second time she has turned him down. I think that her place at court will sort of be in and out. She’s definitely got a presence at court now, but she is still running her business. Her passion for the business means she is certainly not going to say “no” to it for anybody, even Queen Mary. 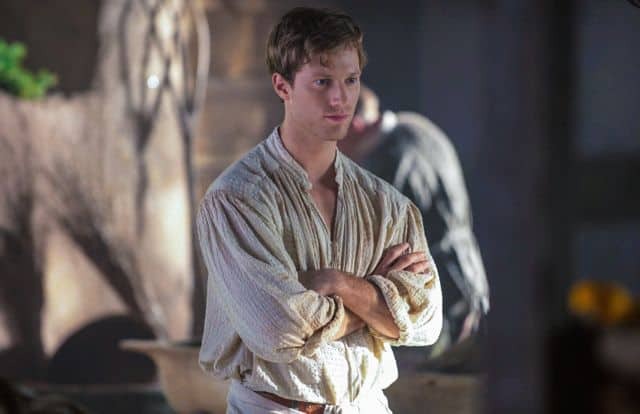 So I that she is going to be very much involved with everybody with what she’s going on and Leith is definitely involved in his new job and career, as well as bodyguard to the princess. Claude is kind of a crazy handful of a woman. JONATHAN: She is indeed. I think that there is a beginning of a friction/chemistry, but more of an understanding. They come from completely different worlds and completely different upbringings, but they are starting to find some common ground. So who knows what will happen next season. We can see the romance happening, but would Leith actually want to marry Claude and marry into that crazy family? JONATHAN: I’m not sure. I think probably would be the most important thing would be what her brother thinks of it. First and foremost, Leith’s allegiance is to him. I could see Francis giving his blessing. He could be all for it. JONATHAN: I would like to think he would be. But, as an audience, we know Francis doesn’t have much time left with us. So who knows what the rest of his life is going to be like. Well, Catherine kind of handed over her daughter on a silver platter. That could be an implied blessing. JONATHAN: But where is she? She’s in England. She sort of betrayal the throne. So I think we’ve got an interesting evolution of the show and we will see what the new face of it is. We have the three queens of Europe in play. I was just telling your co-star Torrance that sounds like a dangerous game of chess. JONATHAN: It certainly is! Queens can go anywhere on the board. It’s not good. 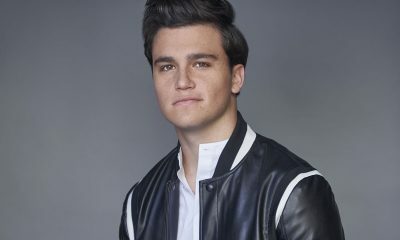 And of course Louis is still alive, so there is another potential king at play as well. JONATHAN: Yeah, Louis is still alive, but I think he’s going to be licking his wounds for a while. Whether or not we see smatterings of him or he’s up in England, we’ll see. But I think that he’s not going to be a king, just a knight who might take out some pawns on the board. JONATHAN: Absolutely. It’s interesting because we worked together throughout most of the season. All those that are close to the crown, there’s holes forming and there are those of us tightening up our guard. Hopefully, Leith and Bash can keep everything safe again. Have you been told anything about that figure that Claude keeps seeing? JONATHAN: So now the servants saw it as well and there are multiple people seeing it. So it’s there. Where it is? Who it is? What it is? We’ll just have to see. It was creepy having him there in the tunnel. So it will be interesting to see how that plays out next season. 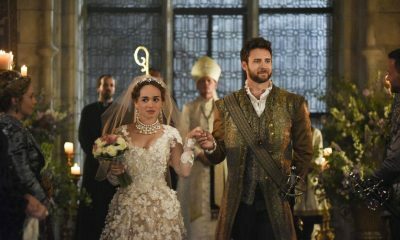 With the prospect of a romance in store for Leith and Claude, a mysterious man hiding in the tunnels, and the reality that Francis’ life is really on the line and he may not making through next season and what that will mean for all the characters in the French Court, REIGN returns with all new episodes for its third season coming Fall 2015 on Friday nights at 8:00 p.m. on the CW.